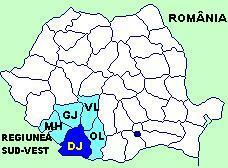 County is situated in the South-West of Romania, on both sides of the lower course of the river Jiu. It covers an area of 7.414 km2, with a population of 725.342 inhabitants ( on July 2003 ) . It ranks among the most important counties of Romania and it belongs to the South – West Region which covers entierly the historical province of Oltenia. Its name, Dolj ( that is ‚the lower Jiu’ of Doljiu ) comes from the Slav word Dolii ( low ) and Jiu – the name of the river that runs through this beautiful lowland like an axix. To the South, the county borders on the Danube ( along 150 km ), Romania’s natural border with Bulgaria. The vast water meadow of the Dnube is Romania’s lowest relief ( 25-30 m above sea level ), in which the country’s widest dunes are to be found as well as a great number of lakes. The outlying extrenities of the Geltic Plateau, 200-300 m high, stretch in the northern part of the county. The relief of the county is not too varied, yet neither is it monotonous.